It is more than the latest offering on Margaret River’s rise to wine and gastronomic fame. 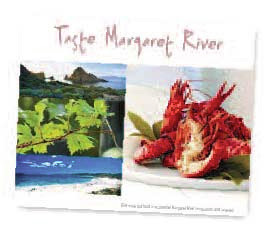 Adrian and Kerry Broom’s book, Taste Margaret River, is a veritable feast of everything that is wonderful about this stunning region. The magnificence of the wineries, along with the scenic beauty of this fabulous region and food that simply sets your mouth watering, all captured by Western Australia’s top photographers. The pictures are breathtaking and to top it all, the region’s most sought after chefs have surrendered their recipes for you to add to your list of gourmet offerings. Printed in glorious colour and available in hardback or paperback versions, every page offers something sensational and is a souvenir dedicated to the triumphs of an industry obsessed with its search for excellence. And when you’ve finished perusing its tempting content, you’ll need to satisfy your taste sensations because every page entices you to try its offerings. Smell the aromas of great food; feel the sea breeze on your brow and taste the mellow flavours of some of the best reds and whites as you escape and enjoy one of the most engaging coffee table books released this year.